Description: After the chairman of the Royal National Gallery is denied the power to simply fire Mr. Bean, he sends him to America for the unveiling of the famous Whistler's Mother painting instead. Under the guise of an intellectual art professor. How do you turn an almost completely silent character into the turning point of a 90 minute movie? Is it even possible? Mr. Bean is the character in question - and they certainly did a very good job of trying! I say 'trying', but that's not really fair to the movie itself. When it comes to the visual gags - the whole point of Mr. Bean - the movie certainly delivers. Rowan Atkinson is in tip-top shape as the ultimate walking disaster that is Mr. Bean. Peter MacNicol is also the perfect foil to Bean, as he just embodies frustration so well in this movie. The poor character is tortured to absolutely extreme extents and Peter MacNicol really does the job well. I guess I just like his look, he really looks the part. However, when it comes to the actual meat of the movie - the plot - the movie just kind of fails. 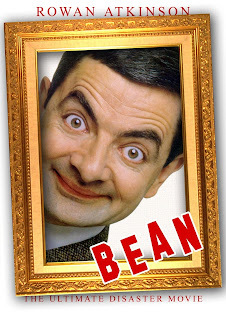 So you have this amazing setup; the chairman of the Royal National Gallery cannot fire Mr. Bean. At the same time the American gallery, 'The Grierson' has gotten back the painting Whistler's Mother from the French thanks to an anonymous donor. The Grierson asks the Royal National Gallery to send a big name art professor to give a speech about the painting at the day of the reveal. The chairman sees an opportunity and sends Bean instead. The setup is very good, and there is definitely a lot you can do with the concept of having Bean come to America. Anyone who's seen the original series can tell you that everything that can go wrong WILL go wrong. Where the movie fails isn't really Bean himself - granted, he's never been a very detailed character, but you certainly get what you came to see. In the series he is very much the cause of his own grief and the grief of those around him. You might as well let a bull into a china shop. He's that bad. No, the problem of the story lies with the rest of the characters - especially that of the co-star's wife, played by Pamela Reed. Don't get me wrong, I'm not blaming Reed for this. She did what she could, and I'm sure she's a very talented actress. However, the character of Alison Langley played by Reed is one of the most unintentionally shallow, hot-headed characters I have ever encountered on screen. So here's the setup: Peter MacNicol plays the facilitator at the unveiling of Whistler's Mother. To set a good example for his kids - and in turn meet with someone he assumes is very intelligent (remember that at this point all the American characters think Bean is a brilliant professor). He decides to let Bean stay under his roof for the duration of the museum planning and unveiling. Bean shows up in the Langley residence, and before he even sets one foot inside, Alison Langley decides to take the kids and go live with her mother. Bean hasn't even given her a reason for her hatred yet. The character is unusually cruel and unnecessarily so. Unfortunately, this is not the only case, as most of the other characters in the movie (besides the son and the co-star) are very single-minded one-note characters. They just don't fit into a complete movie. Bean is a very funny character, with some big possibilities for disaster. However, the shtick of the character just doesn't lend itself very well to the big screen. What's funny about Bean is just how disastrous consequences he can get mixed up in, and they really should have gone the extra mile for how cartoonish the problems could have been. Unfortunately the movie becomes a string of very short funny scenes, with almost every scene with the talking characters being kind of forgettable. Will you get what you paid for with this movie? Sure. You'll get your fill of a collection of very funny Mr. Bean-type slapstick humor, unfortunately it just isn't held together with very good glue, and as a substantial movie it just fails.